Preah Vihear Temple - In the 6th century , king Yasovarmamn I ( 889-900) began work on the original dedicated to Shisa as result of spiritual development, increased political prestige and economic growth was naturally reflected in the Temple undergoing more than 300 years of consultation with deal of remodeling under subsequent King Suryavarman II ( 1113 -1150) this increased prestige naturally changed the original small sanctuary into one of the greatest Khmer temples of all times. 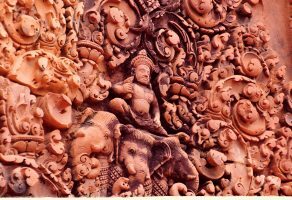 This ranking was the result of the finest in situ carving that depicted the highest standards of unique Khmer architecture. Under the Franco-Siamese Treaty of 1904 and 1907, the line of frontier between Cambodia and Thai along the Dongrak Mountains followed justice at the Hague officially found that the Preah Vihear Temple situated inside the Cambodia territory. The World Heritage Committee, meeting for its 32nd session, finished inscribing the Temple of Preah Vihear sites on UNESCO?s World Heritage List on 8 July with the addition of 19 cultural sites and eight natural sites to the List. Preah Vihear Temple is located in a pleasant environment with an attractive countryside slightly east of the mid section of the Dongrek Mountains.It is perched on the edge of a giant cliff, about 625 meters above sea level in Preah Vihear Province, Northern part of Cambodia, 625km from the capital city of Phnom Penh. 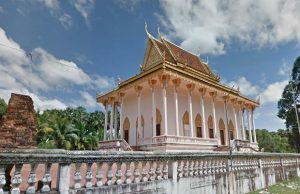 It is also situated close to the Cambodia-Thai border.The temple has four levels and four courtyards which comprise of five Gopuras ( entrance pavilions some times surmounted by tower ) Palace Building or Gopuras on the third level: This group of building was the King's residence when he came to pay homage to the mighty God , and the two wings were the shelters for the pilgrims. The main temple are used for the high-ranking supreme divinities, this mighty group of building is considered as the center of the whole temple complex. The front stone stairway: this main passage is on the North side. The stairway is 8 meters wide and 78 meters long,. The fist flight has 162 steps. At the first landing is a large stone singa statue on stone block. Another 54 flight of steps 4 meters wide and 27 meters long leads up to the second landing also decorated with stone signa statue. The Nagaraj Courtyard: this stone-paved is 7 meters wide by 31.8 meters long. From here the stairway leads up to the first-level Gropura. The Stairheads are in the form of seven-headed snakes called "Ngu Suang " facing North towards the Prasat. The heads and tails of nagas on both sides look like ordinary snakes, characterizing and early example of this type of animal figures. The head portion of the naga on the west side looks very impressive because it is made from a single solid stone. The first level Gopura : this is a pavilion in Greek architecture style with cross plan on an elevated, rebates angle base on each of the roof doorway . Stone lions are placed on each of the roofs dooeway. 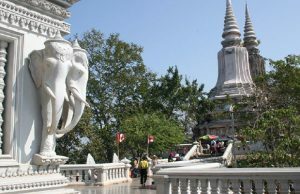 The temple can be reached by crossing the Cambodia-Thai gateway border from the Ubon Ratchantani Province of Thailand. Currently the visits are from 8.00 till 16.00 hours. 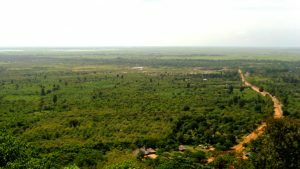 For all the grandeur of its site, perched on the edge of a giant cliff and with a commanding view over northern Cambodia, Preah Vihear is difficult to visualize as a whole. The experience is truly a memorable one the series of ascents over the best part of a kilometer, the ornate Gopuras and the wealth of decorative detail truly staggers one's imagination.